Beginning November 1, Mark Tewart, author of How to be a Sales Superstat will tour cyber space. We will be visiting sales, marketing and business blogs. Mark’s touring during November and December. We plan to visit many sites and look forward to sharing a lot of information to help people become Sales Superstars. I’m continuing to add blog stops to the tour schedule – so check back for more details. People who would like to participate should contact me at nikki@nikkileigh.com. These days, making the sale is tougher than ever. That’s why sales professionals and business owners need more than just smooth talk to make it in the business. Selling is a job that requires an updated toolkit for real, lasting success. 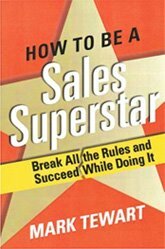 How to Be a Sales Superstar teaches salespeople all the specialized skills they need to be a superstar and shows them how to implement those skills immediately. Readers will master the people skills necessary to relate to prospects and read their meaning; the life skills needed to be successful at any endeavor; the marketing skills to draw in new customers and keep the old ones; and the sales skills to eliminate objections and close the deal. You can become a sales superstar—and get rich doing it. Most salespeople are frustrated from underachieving or failing in their sales career. Because traditional sales training is outdated, it contributes to that frustration. In How to Be a Sales Superstar, Mark Tewart defines a new course that you can use to join the elite ranks of sales superstars. rewarding profession. But this book isn’t about how to be simply good or better at the art of sales. Instead, it reveals the myths of selling that keep the majority of salespeople broke, frustrated, and unhappy. It’s about how to succeed wildly and become a sales superstar. To be a sales superstar, Tewart reveals, you must master sales, people, life, and marketing skills—and he explains step by step how to implement these skills in all aspects of business. He shows how people skills are not just about relating to people, but being able to understand them in order to make relationships work. He underscores the importance of life skills and why you must learn exactly how to think, what to do, when to do it, and why you are doing it. He reveals marketing skills that use low- or no-cost techniques to get new customers and keep the ones you already have. And he provides sales skills that show you ways to eliminate eight out of ten objections before they even happen. Selling is a job that requires an updated toolkit for real, lasting success. How to Be a Sales Superstar gives you all the specialized skills you need to sell more and sell better. Put these skills to work immediately and become a sales superstar. Mark Tewart is renowned expert on sales, sales marketing, sales management and creating a high performance life. Mark is a motivational speaker, consultant, coach, entrepreneur and owner of four businesses, and author of “How To Be A Sales Superstar – Break All the Rules and Succeed While Doing It” published by Wiley which is available in book stores and Amazon. Mark has spoken to over 2,000 audiences in the last fifteen years. Also, Mark has published hundreds of articles in numerous trade magazines and authored numerous books, audios, videos and online training materials. Mark has had a top ranked Satellite TV show and been interviewed by magazines, newspapers, radio and TV shows across the world. Thursday November 13 – Salesconx Newsletter contains information about Mark Tewart today. Thursday December 4 – Blog Business Success Radio – 8:00 PM EST – Call-in Number: (347) 996-5832 – You can download the recording to listen after the show. Monday December 15 – http://www.blogtalkradio.com/Coach-Camille/2008/12/15/The-Success-Hour-with-Coach-Camille-Interview-with-Mark-Tewart – Live at 6 pm EST – Call-in Number: (347) 326-9317 You can download the recording to listen after the show. Monday December 15 – http://joyceanthony.tripod.com/blog/index.blog/1864736/mark-tewart-shares-on-how-to-become-a-sales-superstar to learn more about Mark Tewart. Monday December 22 – http://www.blogtalkradio.com/nikkileigh/2008/12/22/nikki-leigh-talks-with-mark-tewart Call-in Number: (347) 215-8201 – 3 pm EST – You can download the recording to listen after the show. Tuesday December 23 – http://www.blogtalkradio.com/consciousdiscussions/2008/12/23/explode-sales-responsibly Call-in Number: (646) 478-4758 – 1 pm EST – You can download the recording to listen after the show. Kevin Gerard’s virtual tour to promote Conor and the Crossworlds Book 3 – begins on November 3rd and extends through the entire month. His tour is posted at the bottom of this page. Conor and the Crossworlds series. This series opens with book 1, Conor and the Crossworlds, when 10-year-old Conor Jameson unconsciously calls forth the power of the crossworlds creators who send the mystical beast, Purugama, to accompany the boy on a fantastic journey into the realm of the crosswords. This immense collection of mystical worlds connects by organic “corridors” that allow creators, champions, seekers, and at the other end of the spectrum, destroyers, shadow warriors, slayers and keepers to travel between worlds as easily as Conor walks between the rooms of his home. In book 2, Peril in the Corridors, the story continues when Conor and his huge mentor disturb the integrity of the crossworlds corridors, and must join the Lord of the Crossworlds Champions, Maya, on a mission to repair them, with all of creation hanging in the balance. In book 3, Surviving an Altered World (due to be released in December 2008), Conor and Janine Cochran, two everyday high school students find themselves caught in a race to save an altered world after Conor ignores his mentors’ warnings and divulges secrets about his past. While still teaching at the university, Kevin Gerard spends the bulk of his time writing for publication. The Conor and the Crossworlds series provided the main impetus for his decision to permanently extricate himself from formal employment. Kevin Gerard lives in San Diego, California, with his wife and four children. He teaches sociology and statistics for the California State University. When not writing or teaching, Mr. Gerard enjoys walking the grounds at the San Diego Zoo, golfing with his father, hitting the waves and his favorite pizza hangout with his brother, nieces and nephews, and loving his wife and kids. He also enjoys playing Halo on the internet; look for him in the rocket games as Drazian, the destroyer in the first Conor and the Crossworlds adventure, Breaking the Barrier. Would you like a preview of Conor and the Crossworlds? 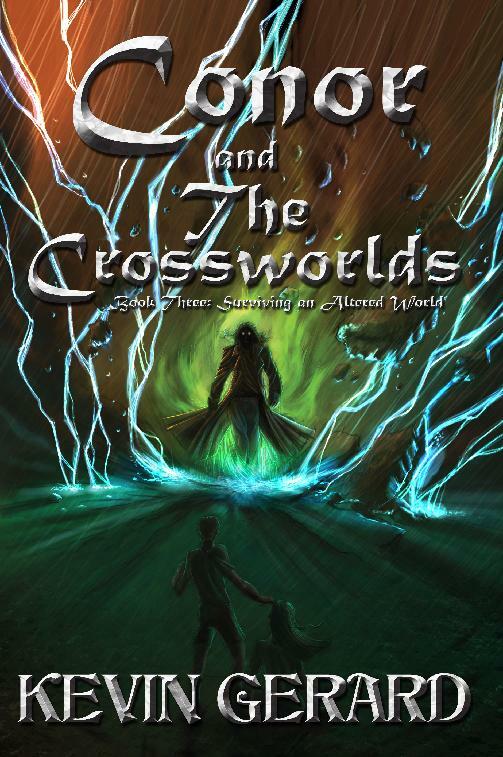 Click here www.conorandthecrossworlds.com to download your FREE ebook that gives you details about the series and the opening chapters of each book. If you haven’t checked into this book yet, I highly recommend that you take a look. This romantic suspense novel has a bit of romance, intrigue, suspense, murder, tension, family issues, inner struggle, and much more. It will have you rooting for the heroine as she struggles to make a new life for her and her daughters in a culture that does not value daughters. Shobhan Bantwal shares some details about her Indian heritage today and she explains how that background works its way into her books. Today is my interview with Shobhan Bantwal and it is also the last day of MaAnna Stephenson’s virtual blog tour blitz to promote The Sage Age. Have you gotten your own copy yet? Is there anyone on your gift list that would enjoy learning about how to blend intuitive and scientific knowledge? Conor and the Crossworlds series. This series opens with book 1, Conor and the Crossworlds, when 10-year-old Conor Jameson unconsciously calls forth the power of the crossworlds creators who send the mystical beast, Purugama, to accompany the boy on a fantastic journey into the realm of the crosswords. In book 3, Surviving an Altered World (due to be released in December 2008), Conor and Janine Cochran, two everyday high school students find themselves caught in a race to save an altered world after Conor ignores his mentors’ warnings and divulges secrets about his past. Gurutej has informed me that she wants to call this the “Mental Clarity Tour”. Do you want to learn more about Stress Reduction, Anxiety Relief, Yoga, Health, Healing, Energy, Meditation, Sleep, Success? She offers valuable tips to help you clear your mind, relief stress, etc – visit her YouTube page for tips – http://www.youtube.com/user/theenergygurus. Dyan wants to reach out to people who are interested in energy, manifesting, chakra balancing, healing music, you could be a host for Dyan’s tour. We want to reach people who are interested in these topics and who have tried The Secret but aren’t getting results. Her manifesting therapy can help you discover the problem and move past these blocks. This is the most unusual promotional event I’ve worked on in some time. Read on, I think you will want to be involved. Beginning November 17th, CJ will tour cyber space to share her message. As you read above, she is working to bring legions of people into this project and you are only asked to do one kind thing each week for the next year. You can help anyone who needs a helping hand. Let’s spread the word and spread positive thoughts and actions around the world. Would you like to host CJ during her tour or do you have questions? Contact Nikki at nikki@nikkileigh.com. Take a few minutes to watch CJ’s video which explains what she is doing and shows you some of the things she has done – www.youtube.com/thekissrevolution. Each person is invited to visit http://www.thekindnesscure.org and join the revolution. Would you and your blog readers or radio listeners like to learn more about easy ways to make a major difference in your life and the life of others? If so, this is a woman that you need to interview. C J Scarlet has dealt with her own critical health issues and she understands that “hopeless” feeling. But, she learned that focusing on helping others helped her mental and physical well being. Are you or a loved one facing a health or personal crisis? C J’s project can benefit you both. With seventeen years as an advocate for individuals facing tragedy and trauma, and a Humanities Master’s Degree with an emphasis on Human Violence, CJ has a solid understanding of the myriad physical and emotional challenges people face and how they habitually-and often ineffectually-respond to them. Tony “Tony Nap” Napoli is the son of one of the most powerful and respected organized crime leaders of the modern era. Tony’s father was Genovese Family Capo, James “Jimmy Nap” Napoli-a mob kingpin who ruled over the largest gambling empire in America for almost 40 years.